Hire a Full Time Nanny today - Hiring a Full Time Nanny is a wonderful option if you are looking for broad, comprehensive, safe at home child care. A Full Time Nanny is not only a talented caregiver, but also should be a family friend for life. Be fair and honest with your Nanny. Hiring a Live-In Nanny may be a wonderful option if you are looking for full-time, in-home child care. Live-In Nannies can help your children get off to school in the morning, can greet them when they finish their school day and bring them to practice and play-dates. They can also make your evening comfortable and positive by encouraging good study habits and proper hygiene from your children. A part-time Nanny generally works under 25 hours per week. That will definitely be convenient for you if you work part-time yourself, or if you need someone to take the kids off your hands while you are pursuing other goals and activities, either inside or outside the home.art-time Nannies often have families and children of their own to look after between part-time jobs, or they may be students who work part-time for extra income. Live-Out Nannies often work 8 to 10 hour days. Generally responsible for all aspects of childcare during their working hours. Transporting a child to after-school activities or play dates, helping a child with homework, arranging and supervising play time activities for a child and taking a child on outside activities are all common duties of a Nanny. Doing the child's laundry, preparing a child's meals and may also be the responsibility of a Nanny. Emergency Child Care is a unique solution for parents to the back up child care dilemma. Through Nanny Poppinz™ you can book an emergency Nanny, when your regular child care has broken down. Nanny Poppinz™ is available to our clients 24/7, including holidays. Call us right away and we will help you! Personal Assistants, Butlers / Administrators, Caretakers, Caretakers, Cooks and Chefs, Estate Managers, Housekeepers, Housemen, Major Domos. We have experience in staffing high profile and celebrity clients with high end and large homes. 1-50 days - Temporary Nannies are paid by the hour-depend on a variety of factors, from where you live, number of children (max number of children is 4) and their ages. An after school Nanny can make sure the children get home safely from school, prepare them a healthy snack and get them started on their homework until mom or dad gets home. An after school Nanny may shuttle the children to after school activities the children may be involved in, and then makes sure they get home safely after their activities.The Nanny can guide children with whatever after school activity parents have scheduled for the children. If the Nanny will be transporting children we also do a complete driving (DMV) check on the Nanny. Nanny Poppinz™ Babysitters meets the same standards as our Nannies, a minimum of 18 years old, each and everyone of our Nannies are CPR/First Aid trained and have a minimum of 3 years of verified experience working with children and completely background checked.Babysitters are paid by the hour-depend on a variety of factors, from where you live, number of children and their ages. The expectation for in home child care is that it should not include tasks not related to your children and their care. Minimize asking your Nanny to perform non-childcare related tasks that may take away from what should be their primary focus - the care, safety and nurturing of your child(ren). Tasks directly related to childcare can be within the realm of a Nanny's job description, however - depending upon the circumstances of your family. Homes schooling Nannies have a degree in education. The teacher's job is to supervise and teach the children during the hours the parents set, following closely guidelines of the parents, teachers are generally allowed a great deal of freedom in choosing teaching methods and daily plans. The teacher would be there to enhance it and to make sure that the children go throughout their day smoothly while providing a dynamic and unique educational program. Whether skiing in Colorado, or playing on the beach in Cozumel, Mexico, having a Nanny along to help with the children means mom and dad can relax and really enjoy their vacation. Taking a Nanny on vacation is becoming more popular among families. Take a Nanny to travel and assist you on vacation. Mother's Helpers tends to be younger and less experienced than a Nanny. A Mother's Helper essentially helps out a stay-at-home parent or a family needing extra help while they are home. A Mother's Helper mostly works under some supervision to handle all aspects of child care, errands, easy meal preparation and light house work pertaining to the children. A Night Newborn Care Specialists comes into the home from 9 or 10 at night until 6 or 8 in the morning to tend to the baby so that the parents can, sleep. A Night Newborn Care Specialist will stay in the baby's room, feed the baby, burp the baby and settle the baby back down. A night nurse could offer a wonderful reprieve for couples with multiples, a sick baby, or special circumstances, but, for the most part, these are healthy couples (one or both parents home on maternity leave) with healthy babies. We offer childcare for school age children that are off for school vacation days or ""teacher work days"". We customize our services to meet the needs of each family, our Nannies can handle this in a variety of way, they can be there one-on-one with the child or can offer fun and excitement for children during their vacations or days off from school. We're here when you need us most, because we're moms, we know what other moms (and Dads) need. Day or Night, we're here to serve you. When you select someone to provide sick child care, remember that our Nannies are trained and experienced in providing compassionate care. We specialize in providing childcare solutions to parents nationwide 24/7 including holidays so that we can help in whatever way you need. Previously known as a baby nurse, a Newborn care specialist is an experienced trained infant/newborn specialist who comes into your home in the first weeks of your infants life to assist mom and dad with the day-to-day care of their new baby. Newborn care specialist work 24-hour days, meaning, they are on-call at all times to care for the baby. A baby nurse educates the new parents on caring for their new infant, assists in establishing a routine eating/sleeping/wake schedule for the baby and provides lactation consulting to breastfeeding mothers. There are several ways to share a Nanny. Perhaps you would like the mornings free? Share with a family wanting childcare in the afternoon, leaving the Nanny an hour or so in the middle of the day to travel between homes. If you just want a day, or two, or three, you can share with a family which wants help on the days that you don't. Families hire a Nannies for the summer because kids are out of school for the summer and aren't old enough to be left home alone all day. During the school year it is easier for parents to coordinate activities or after-school care for their child for a few hours, in the summer it is a different story. A Summer Nanny may aslo travel with the family and care for the kids while the parents do activities separate from their children. It is an ideal situation for a family that can afford a summer Nanny for this specific reason. High quality childcare goes a long way to making successful family vacations, especially when you're traveling with babies and toddlers. Parents, rest assured, a couple who skis or scuba dives does not have to curtail their outings once a baby comes along. The top hotels and resorts for families have a full complement of possibilities for day time and evening babysitters. Nanny Poppinz™ knows the ins and outs of caring for young children on vacation. On-site childcare for conventions and conferences. 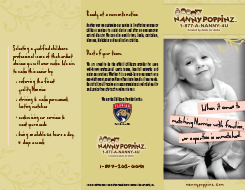 We provide stadium childcare to the Florida Marlins and the Atlanta Braves - 85 games/times a year as well as the Denver Broncos, Atlanta Hawks and Florida Panthers.Nanny Poppinz™ has provided quality childcare for children of all ages at weddings, conventions, trade shows, corporate and sporting events. The leading providers of companion care for the elderly across the country. We are a professional service company providing families in need of non-medical practical care and companionship for seniors in the comfort of their own home. Our compassionate caregivers are specially screened and selected to provide the highest level of assistance of elder home care services to allow one to maintain independence and a high quality of life by staying wherever they prefer to call home instead of a assisted living facility. Many parents want Nannies fluent in another language to help tutor their tots. It's important for the child to see that the language is valued by other people -- adults and children alike. Many parents seek caregivers fluent in another language and culture. Nanny Poppinz™ has seen a sharp increase in the last five years in requests for caregivers who speak a language other than english. When essential employees are needed in the workplace during a time of a natural disaster is when they need childcare solutions most. We customize our services to each client, in what ever way they need us. We currently service a number of Florida companies when hurricanes strike Florida. Our services are FREE until you have selected your Nanny! Nanny Poppinz does not charge a fee of any kind UNTIL we provide you with the Nanny of your choice.